After the flurry of awards contenders that filled UK cinema screens across January and February, we move into March and more familiar cinematic territory, with movies such as ‘Red Sparrow’, the latest film starring Jennifer Lawrence. It’s a Russian set spy thriller (complete with dodgy accents), focusing on Dominika Egorova (Lawrence), a ballet dancer who finds herself working for her uncle (Matthias Schoenaerts) and the state after she suffers a career ending injury. That work involves becoming a ‘sparrow’, essentially a young, attractive female whose purpose is to seduce persons of interest, and in the case of Dominika, that person of interest is the ludicrously named Nate Nash (Joel Edgerton), a CIA agent known to be in contact with a mole within the Russian intelligence services. This is a glossy spy thriller with a lot more style than substance, reminiscent in many ways of 2016’s ‘Allied’ in the way that its intention is to keep the audience guessing as to the characters true loyalties, albeit unlike ‘Allied’ I felt it was fairly clear where Dominika was leaning. The film is undoubtedly too long and would have benefited from tighter editing to improve the pacing and help to generate some momentum but it is quite good fun at times and the performances were engaging enough to hold my interest. Jennifer Lawrence is certainly putting herself through the mill in recent films such as this and Darren Aronofsky’s ‘mother!’, with ‘Red Sparrow’ utilising some extreme violence (mainly towards Dominika) that feels like its veering into slightly exploitative territory at times. The supporting cast are good, including the likes of Matthias Schoenaerts, Jeremy Irons and the always welcome presence of Charlotte Rampling as the Headmistress of the ‘Sparrow School’. ‘Red Sparrow’ is a solid spy thriller with strong performances elevating an uneven script, and it is essentially a classic 3 star film in my book. 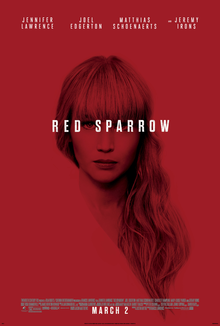 There were a lot of elements that I did enjoy and the film was better than what I expected after the first twenty minutes, which was something more akin to the slog that was ‘Child 44’, but at least ‘Red Sparrow’ has some fun with its premise. I particularly liked the conclusion and felt it was a smart way to tie everything together, even if the journey to get there was often more arduous than it had to be.